TUNA NEWS: What's Wrong with this Picture? What's Wrong with this Picture? I have never had any sort of desire to drive out to the middle of the field and jump into a giant floating bread basket powered by the whims and winds of mother nature. 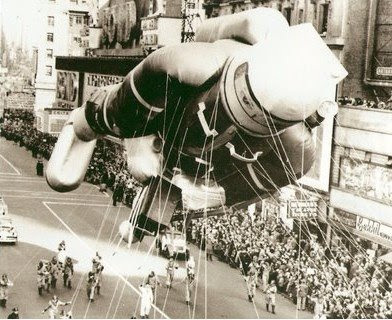 I've seen too many unfortunate accidents from the Macy's Day Thanksgiving Parade, thank you very much. You WILL have fries with that. Resistance is futile. Run, run as fast as YOU can! 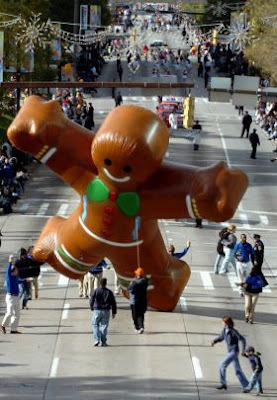 Not technically a parade balloon, but you get my point. I never thought of it as a sudden death overtime match. So I have to ask, 2009 Battle Creek Field of Flight Air Show and Balloon Festival, is this what you're all about? Sure based on your incredibly long titled event, I would expect there would be both airplanes and hot air balloons, but simultaneously? I had heard that the hot air balloon festival was spectacularly beautiful but I had no idea it was an extreme sport. Thanks BCFoFASaBF for broadening my horizons and expanding my mind. I think I'll celebrate with a bowl of cereal. 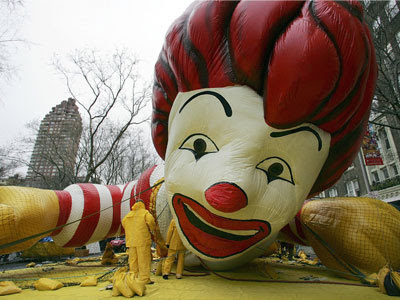 The Ronald McDonald balloon is, quite possibly, the most horrifying thing I have ever seen. You must live a boring life if that is all you have to complain about is the header of a website. I helped design the site, and would appreciate you taking the picture down as it infringes on copyright laws. If you do not take this picture down, you will be hearing from our lawyers. Picture duly removed. Bummer that you didn't like the shout-out. It's not every day you have a picture of jets heading straight for innocent hot air balloons. I loved it. Stay safe, keep up the good work and visit again soon. Everyone should experience a hot air balloon ride; they are unlike anything else in the universe (I think). But you must be patient, because if the weather isn't right (hardly any wind at all) you don't go. And if you've gotten up very, very early to make it to the launch site, you can get very cranky if you don't go. Everyone should also experience the Albuquerque Balloon Fiesta at least once in a lifetime. Consider the entire sky filled with these enormous bags of hot air! Fabulous! Wow. Someone needs to lighten up. "In life, the first act is always exciting but it is the second act -- that's where the depth comes in." Awesome Inc. theme. Theme images by Airyelf. Powered by Blogger.